"Awesome for adding automated webinars to your customer journey"
EverWebinar is intuitive to use and easy to get started with speed. I do not need to generate separate landing pages, or set them up to A/B test. This is already built in and saves me a good amount of time. The landing page options are also vast en built on best-practices with CRO-tactics (like countdown timers). Inside the live room you have the option to automate the live chat. You can use this as a kind of general Q&A. I would recommend someone moderating the chat in this case. But when this is not possible, you can just opt to have questions sent over by email. The option to add clickable and customizable CTA's during the webinar is also pretty useful. They also integrate easily with other CRO tools or marketing automation. They were not that clear about their pricing plans, which made me question the quality of the product. They also do a lot of push for training and consultancy, which can become a bit annoying at times. Also, their original landing page and commercial material was a bit "salesy", which originally put me off. There are really not that many competitors I know of who offer their functionality. Everwebinar is a good tool for Middle-of-the-funnel content to add to your journey. Especially when volume is too low for live webinars and your target customers or spread across different timezones. It will also allow you to generate and test different webinars, as you would for ad-copy and creative. "Everwebinar is pretty powerful "
It has many features for "on demand" webinars including tracking attendees and if they stayed long enough to see the "Call to action" or not. It also always you to use integrations that will trigger based on specific events like, attended or saw call to action. Very powerful. The support ticketing system wasn't very straight forward, we had a few users with different passwords and trying to track our support tickets was a little complicated. Once you have dialed in a good converting webinar, you can set it and forget it. This has helped us drive in tons of leads. "Everwebinar - Great Platform, But Some Bugs"
I love that you can automate a sales funnel with webinar via Evewebinar. I also love the amount of data/analytics this creates. I can "tag" every participant based on activity and then send them different email auto responders based upon their activity. I haven't seen this in other webinar software. There are glitches. If someone clicks their unique link to watch the webinar from a different IP address, they will get errors. If you makes changes to the webinar after someone has registered, it creates bugs and you have to recreate the whole thing. Perhaps that was convered in a knowledge base or support document somewhere - but my team learned the hard way and had some disappointed customers along the way. The email notifications that get sent from Everwebinar have a very low deliverability rate. I had to set up SMTP to send out the notifications. I'm a lay-person, not a tech person so this was all supposed to be easily included with the service. If you can work through all the glitches and get it set up and working for you - with some help from their support team - I still think Everwebinar beats the competition and has more needed features than other AUTOMATED webinar softwares. For a live webinar - I think Zoom Webinar is something to look into. "User friendly and analytic webinar platform"
My favorite thing about using this platform is the transparency of the analytics provided. It is really helpful to know each attendee, the length of time they viewed the webinar, and be able to locate the recording, among a lot of other great analytics available! I think the platform could be better organized, it took me a little while to figure out how to access the recording. After having used several other webinar platforms for work, I have been satisfied with EverWebinar because of the amount of data provided for each webinar before, during, and after. We do daily informational webinars for students interested in participating in our study abroad programs. "Unprofessional use of my work to advertise their product"
Nothing - it was a frustrating experience that wasted lots of time. There were bugs and problems galore (we've stopped using it) - and it is not AT ALL intuitive - these I could possibly have lived with and worked around. HOWEVER - the truly big thing for me is that, after spending weeks to craft a webinar to get people to a certain place - ready to click a button to my product - Everwebinar do TWO THINGS to disrupt the process: 1: they ask people to rate the webinar (not information I want - and it distracts from my message and the action I'm paying Everwebinar to get across) 2; they then, outrageously, have their OWN LINK on the screen to Webinarjam!! So wrong! Sure, there are some lame workarounds that dont actually either work that well (people still ended up on the star rating/WJ ad) but I also DON'T want to do what they suggest which is have people auto-directed to my sales page - i want people to take action and CLICK my link. Psychologically they need to make that decision - not be directed. A good company SERVES the customer - I don't get that feeling from Everwebinar. It's been a HUGE waste of time and money - don't go there. If you want to pay to use a product that will use your material as a way to promote their material AND one who doesn't care to serve your outcome (despite being supposed experts in this whole field) then go right ahead and help promote them. I love how a non-techie like myself can set up 90% of our automated webinars. There are only a few things I need help with from my techie husband, which is nice. I am not the biggest fan of their option to "trick" attendees with fake audience numbers and worse, fake buyers....it has nothing to do with the platform technology but that's more of an ethical discussion for users. It's easy and fool proof - go for it. We have loved doing live Webinars and done really well with them in our business but we have 3 kids ages 4 and under and so automated our best webinars and building an evergreen funnel is going to get us SO much time and energy back. "Very good at effectively communicating a message to large audiences over time"
It makes it incredible easy to share content in a "live" setting, a great piece of our marketing funnel. The one-click signup options are an amazing tool, too! Saving things can sometimes be a little quirky, but once you get used to it there's no issue at all. Give it a shot, I think it will save you time and effort! After hosting live webinars for time-limited course launches, evergreen webinars seem to be a much better solution for the business I work for. "New Platform is Challenging and had to use"
"Works well with pre-recorded webinars"
I love the automatization possibilities because I can play a webinar every day and it looks live. I also find very useful the analytics tool. Webinars can only be at half past and quarter past hours. We can earn passive income because everwebinar is selling for us. "Awesome tool for automating "live" webinars"
"I'm obsessed with this product"
I love that you can create webinars on autopilot. It's pretty easy to use. I have no complaints. * We monitor all EverWebinar reviews to prevent fraudulent reviews and keep review quality high. We do not post reviews by company employees or direct competitors. Validated reviews require the user to submit a screenshot of the product containing their user ID, in order to verify a user is an actual user of the product. Hi there! 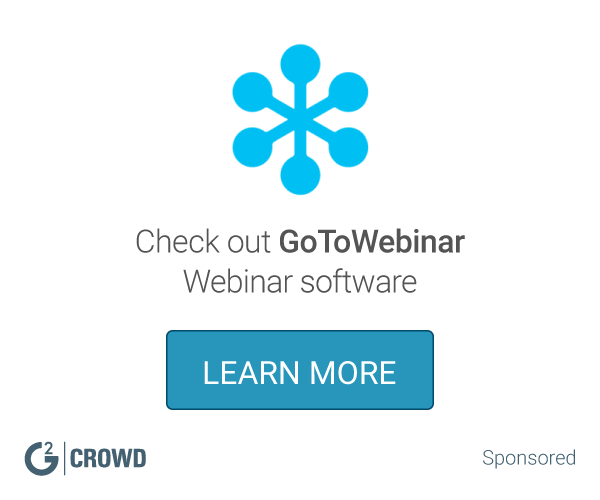 Are you looking to implement a solution like EverWebinar?